The Pirbright Institute took Dr Zoo’s Travelling Science Lab out on the road for the first time at Innovate Guildford 2019, a local science and arts festival which took place on Saturday 23 March. Visitors entering the ‘Viral Survival’ themed mini escape room were challenged with a series of scientific puzzles which they had to crack in under five minutes in order to survive a deadly virus. Together with Pirbright’s interactive stand, the exhibit was designed to showcase the Institute’s research on viral diseases, and particularly those that spread from animals to humans, known as zoonoses. 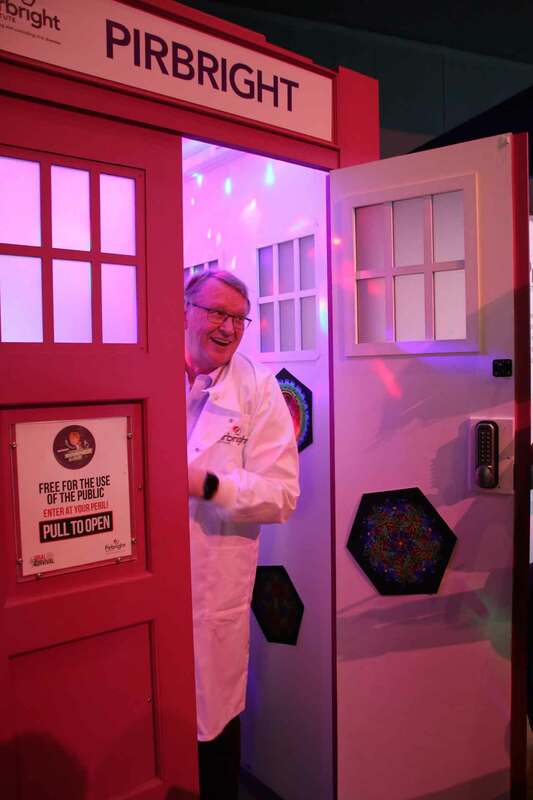 The centrepiece of the exhibit, Dr Zoo’s Travelling Science Lab, was a specially commissioned, bright pink, Dr Who inspired police box housing an array of laboratory-like equipment. Visitors were encouraged to become one of Dr Zoo’s assistants, employing different scientific skills as virologists, vaccinologists, bio-matheticians, and biosafety experts to help evade the deadly disease. Working against the clock participants had to solve three different science-themed puzzles to crack the final code so they could escape the virus. At the stand visitors creased their foreheads, muttered under their breath or shouted exclamations as they tackled a containment box in which a ‘field sample’ from the outbreak could be ‘analysed’ by completing several puzzles. Virologists from the Institute also guided younger visitors through a series of instructions on a LEGO® DNA helix that enabled them to build a LEGO® virus to show how scientists develop vaccines using genetic modification. Complementing the activities at the stand, Pirbright’s Dr Simon Graham and Dr Rebecca McLean gave an engaging interactive talk on zoonotic diseases; where they come from and how scientists develop vaccines for them. This included their own current research on the development of a Nipah vaccine for pigs. 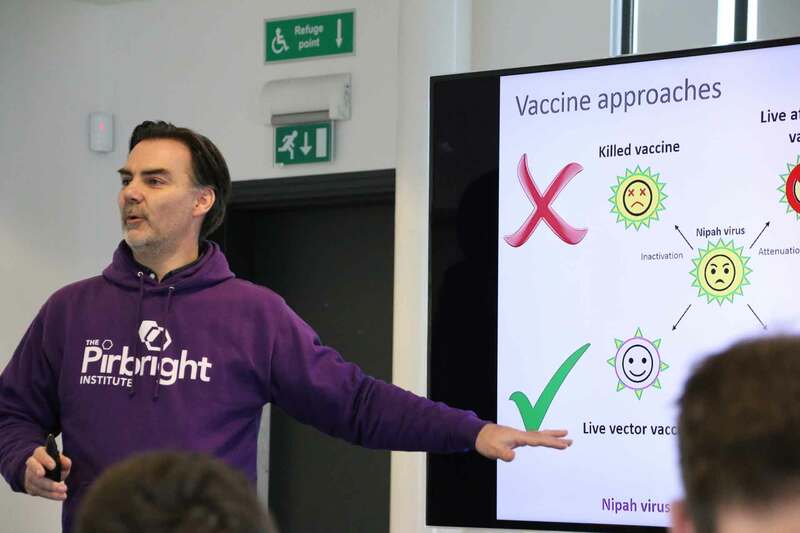 Innovate Guildford 2019 was a huge success, and Pirbright was proud to be there demonstrating its scientific research to an enthusiastic local audience. If you missed us this time, Viral Survival and Dr Zoo’s Travelling Science Laboratory will also be at Cheltenham Science Festival in June with even more fun challenges to complete and another chance to evade a deadly emerging viral zoonosis. Stay tuned for more news and visit us there to join in! For more information see our webpage on zoonoses.